Looking northward over the miles from the woodlands of Nan-tathren, the plains of southern Beleriand suddenly reared into a wide and steep wall of hills. At the base of this wall was a cavernous opening formed from several rocky arches, out of which rushed a torrent of water. This rushing water was that of the great river Sirion, and these cave mouths were thus known as the Gates of Sirion. Having risen in the foothills of the Mountains of Shadow hundreds of miles to the north, the river flowed southward until it came to the Andram, the wall of hills that ran across Beleriand. There its waters pooled to form the meres of Aelin-uial, and flowed sluggishly on until they reached the Falls of Sirion, where they plunged into a deep chasm. 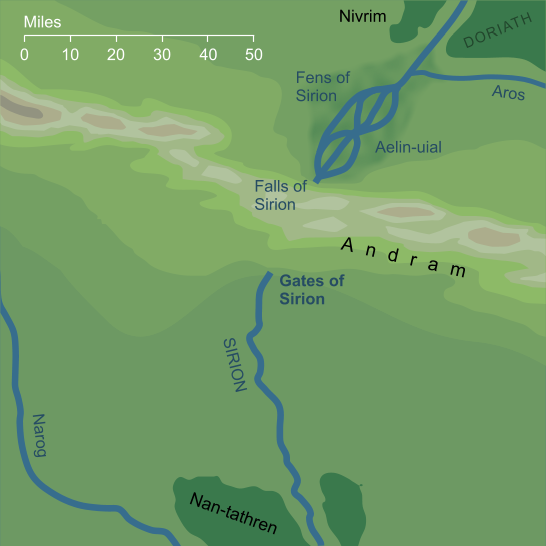 From these Falls, Sirion ran beneath the earth for three leagues (about nine miles) until it came to the Gates in the southern side of the Long Wall, and emerged into the open once again.  From there it completed its course, running southwards for more than a hundred miles to reach the Sea at the Mouths of Sirion. Original content © copyright Mark Fisher 1999, 2001, 2016, 2018. All rights reserved. For conditions of reuse, see the Site FAQ.